The Argos team has been having a cracking time of late as we got the opportunity to work on the retailer’s launch of its Star Wars collection. So it was that some of the team found itself in a field somewhere near Sheffield with a group of rocket scientists cheerfully sending a BB-8 toy into space. As you do. 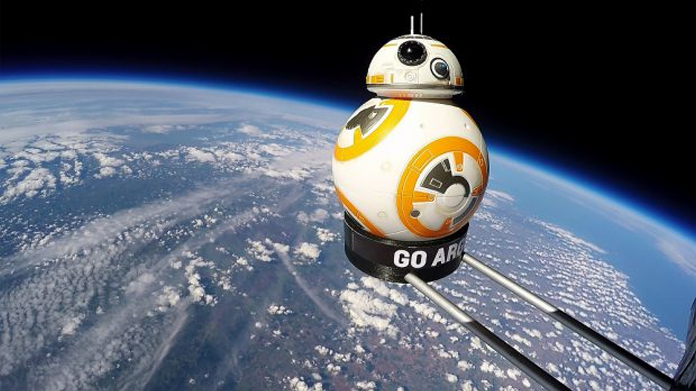 Thankfully, the BB-8 in question made its way up several tens of thousands of meters – and then returned safely to Earth. Equipped with a series of cameras, we captured the ascent and then some stunning shots of the iconic droid hanging out in the lower atmosphere. As a result, our stills and the video made for some perfectly excellent coverage. We had pieces on the Daily Star – a cracker containing every message we could hope to deliver – Daily Mail, Evening Standard, Aol., Yahoo, BT.com, as well as a bunch of the fan sites, including Games Booth, Gizmodo, Movie Web, Get Your Geek On and the splendid Jedi News.